The last time I popped into the Angel & Crown pub my fellow customers included an elderly bloke drinking beer alone, a middle-aged couple sucking each others’ faces desperately – a first date I reckon, a couple of American tourists – no doubt befuddled that this dull and uncared-for environment was the famed British meeting place they’d heard so much about. And me, meeting a friend in a suitably central location where we could be sure of a table and seats. The Angel & Crown has been welcoming punters through it’s doors since 1727, so it’s tired bones were in need of a facelift and new lease of life. Enter brothers Tom and Ed Martin, who’ve been building up an impressive gastro pub business since opening The Well, back in 2000. Since then, they’ve transformed several more pubs (including The Gun, The Botanist and The Cadogan Arms) and also launched the Chiswell Street Dining Rooms in the Montcalm Hotel. They spent only a few weeks tarting up the Angel & Crown before re-launching it as another gastro pub. Downstairs is more of a drinkers’ room, though a bar snacks menu offers a range of tasty treats including sausage rolls, pork pies, half a pint of prawns, a fish finger sandwich, scotch eggs and more. An elegant upstairs dining room is the best place to order from the main menu, which currently offers starters of pig’s head terrine, Dorset brown crab meat on toast and cod cheek, cod tongue and fennel pie, mains of boiled Essex ham hock with peas pudding and parsley sauce, Herdwick mutton hot pot, flank steak with green peppercorn sauce and chips and battered haddock and chips. Desserts include an intriguing Angel Delight butterscotch crème brûlée, Devonshire custard tart with tea steeped prunes and Cashel Blue cheese with truffled honey and raisin toast. They’ve not forgotten the drinks either, and aim to offer some decent cask ales such as Sambrook’s Junction and Adnam’s Bitter, and rotating guest brews. They have a short but interesting list of bottled beers too. Wine drinkers, cider lovers and cocktail fanciers are also catered for, with a short but sweet selection. The new-look pub hasn’t been open long – the Martins took over late last year, spent just a few short weeks doing the place up and opened for business in mid-December. Pete and I were invited along in early January to sample the new menu. We were seated in the private dining room upstairs, which seats 10 comfortably, but can squeeze in a few more. Be warned though, that it’s a bit of a thoroughfare, as guests making their way to the main dining room will constantly pass along one open side of the space. For canapes we were served a range from the bar snacks menu – pork crackling with apple sauce, black pudding scotch eggs with HP sauce and devilled whitebait with tartare sauce. 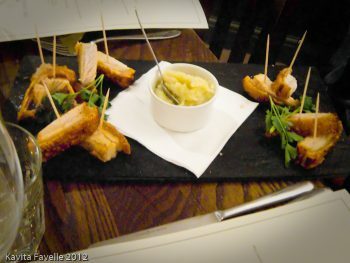 The pork cracklings turned out to be generous slices of roast pork with crackling attached. The first batch that came out were delicious – soft tasty pork and crunchy crackling – but the second batch failed on the crunch test, with soft, chewier skin. The apple sauce was far too thick and quite dry, making it impossible to dip the pork pieces into it – I used a knife to lather it on instead. It tasted nice. 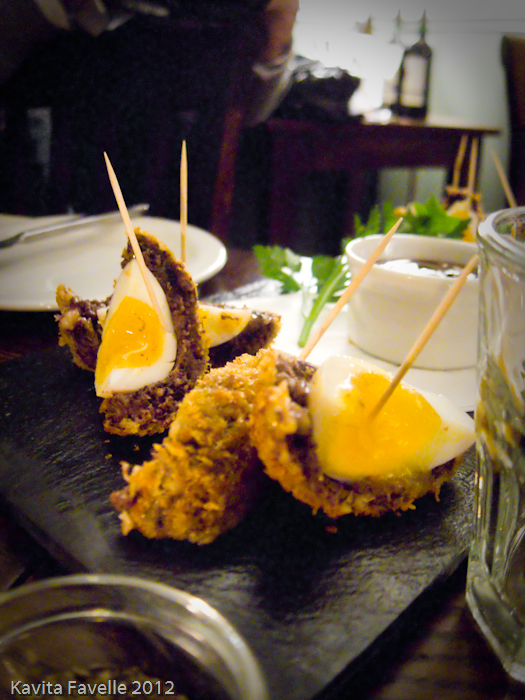 The black pudding scotch eggs were marvellous, perfectly cooked and with very good flavour. 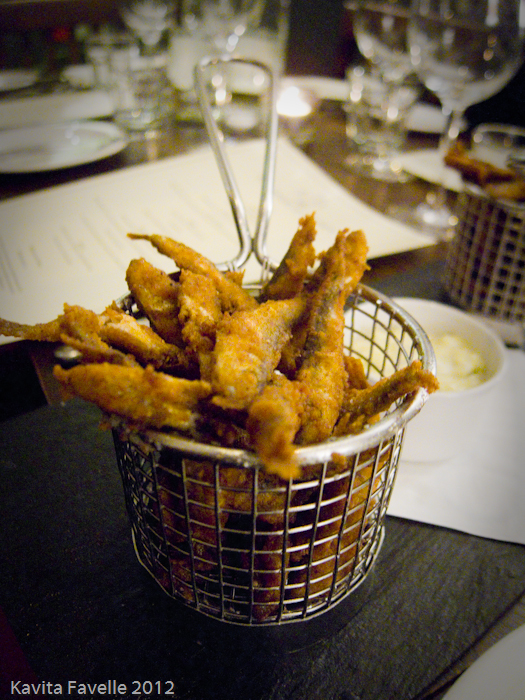 The devilled whitebait lacked any obvious devilment but were served hot and crispy. The tartare was a little bland. The starter of potted smoked mackerel with dill pickle was served in a small kilner jar with a couple of small slices of toast on the side. 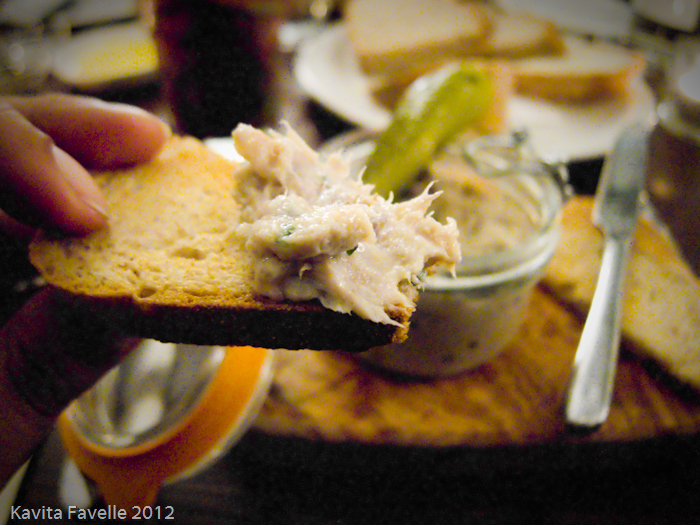 The mackerel was a soft, juicy mix of fish, yoghurt, butter and chives and was very lovely indeed. That said, I’d describe the dish as a soft smoked mackerel paté rather than potted, which is, in my head, something preserved in lots of butter, with the addition of salt and pepper and maybe some ground spice. I loved the juicy dill pickle and could have eaten another. My toast was a bit soggy, though Pete’s was nice and crisp – perhaps a large batch were stacked into a basket during prep and the ones at the bottom steamed in the heat of the rest? For our main course each of us were served a hugely impressive pheasant and partridge pie with roast bone marrow. 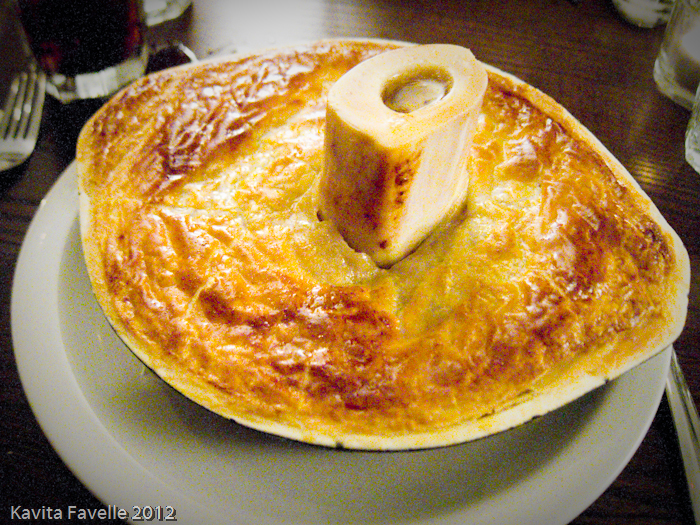 Like Jesse Dunford-Wood’s Cow Pie at The Mall Tavern, the marrow bone created a pie funnel and was visually very appealing. The pastry lid itself was delicious, cooked to give a crisp top and beautifully soft underside, just as I like it! For me, the partridge and pheasant were both quite dry, though the flavour was very nice. And I found the sauce very thin and with a deep layer of oil, perhaps rendered out from the marrow during cooking? I did enjoy removing the marrow bone and slipping the beautiful fatty marrow bone out of it; a real delight! 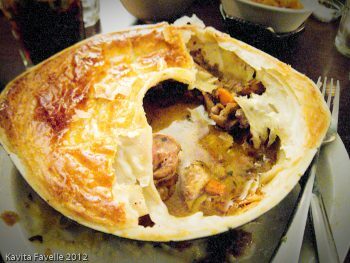 It was a gorgeous looking pie, and with nice flavours too but textures weren’t on the money, in my opinion. 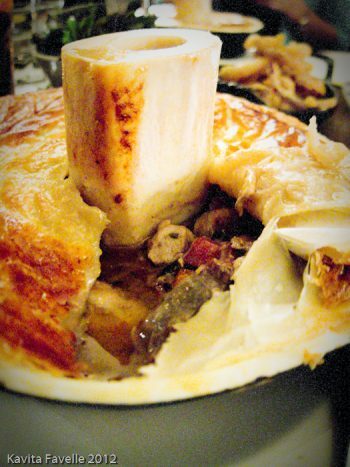 I’d love to try Angel & Crown beef and chicken pies, as I think these are easier to keep tender. 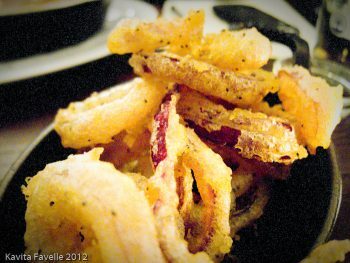 With the mains were served some smashing sides – quick fingers fought over light and crunchy peppered battered onion rings, mashed potato was soft and buttery, and earthy swede had been well cooked and properly seasoned. 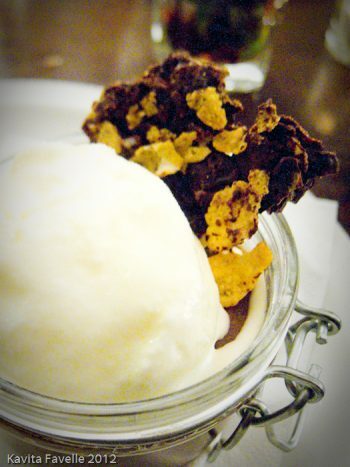 Our dessert of chocolate mousse, cornflakes, crème fraîche sorbet didn’t work on a number of levels. 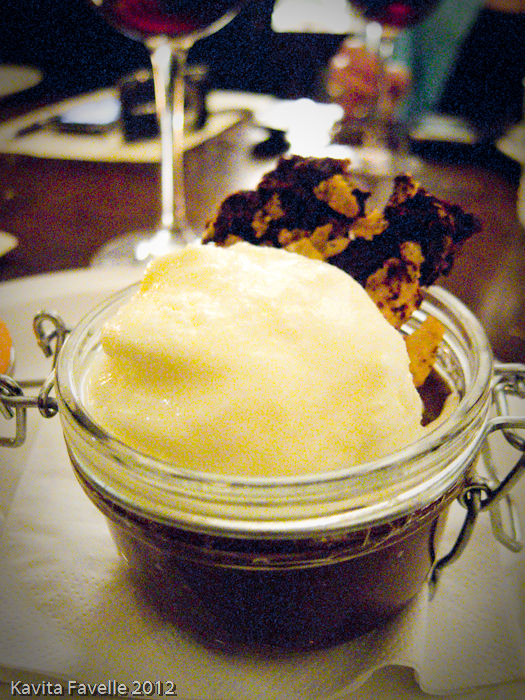 Firstly, I really didn’t like the combination of the sharp crème fraîche with chocolate. I wasn’t alone in that comment. In addition, although we were told they used a 70% Valrhona chocolate in the mousse, the flavour was oddly milky and with a distinct flavour of coconut running through it. The texture wasn’t smooth and velvety, but rather grainy. It just didn’t work. The only element I enjoyed was the shard of cornflakes set in dark chocolate, which was a delight. Drinks wise for me, I needed to stick to the softs, as I would be driving our car home from our local station. The barman rose magnificently to my challenge, when I told him I would like a virgin cocktail and that I had a very sweet tooth, he made me a perfect French Mojito with just the right balance of mint, sugar and lime, with a dark red fruit cordial, I think blackberry. I did allow myself a small glass of Pedro Ximinez from La Gitana, Spain which was served with dessert. As always, I loved the caramel and dried fruit flavours of one of my very favourite tipples. A dessert in its own right, this blew the chocolate mousse out of the water. On arrival, and with the canapés, Pete enjoyed a St Martin’s Mule – a blend of dark rum, vanilla vodka, fresh lime juice, homemade cinnamon syrup and ginger beer. Luckily, as Pete doesn’t much care for cinnamon, he didn’t really taste the syrup much. He described his drink as strong and refreshing and added an odd little addendum that it was “cold and made his teeth hurt”! 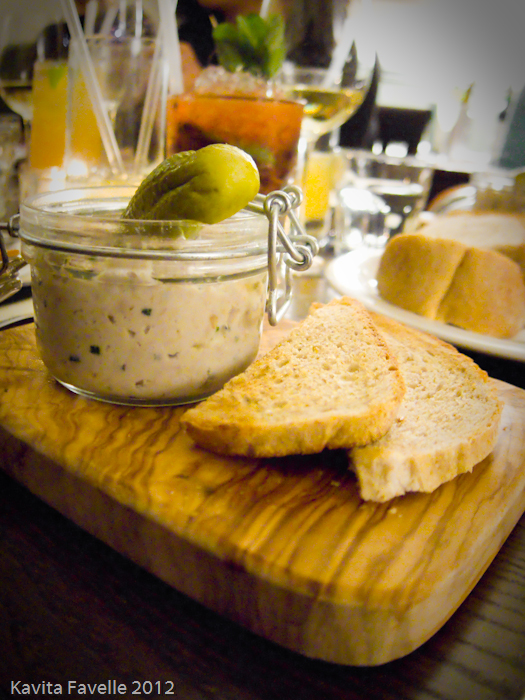 The beer match for the potted smoked mackerel starter was Darkstar Hophead, a pale beer but quite strongly hopped, dry and with a floral aroma (from the hops); the hoppy flavour balanced out the oiliness of the fish very well. A great match. Wine lovers were presented with a Dr Burklin Wolf trocken 2010 Reisling. Just as we were advised, this dry Reisling cut through the fish, and was robust enough in flavour to complement it rather than get drowned out by it. Another good match. On to the pie and Sambrooks Junction. “You can’t go wrong with this one”, a lovely bold beer that has a malty nose and a rich, sweet caramel flavour with malty and hoppy notes. Worked well with the pie because it’s big and sweet and rich; a less substantial beer would have been overwhelmed by the flavours in the pie, but this stood up well. The wine match for the pie was Chateau Musar’s Musar Jeune 2009, a blend of cinsault, syrah and cabernet sauvignon. After our trip to Lebanon last year, we appreciate seeing Lebanon reds sold more widely in the UK. That said, whilst this was certainly a lovely wine, it wasn’t punchy enough to hold its weight against the strong flavours and oiliness of the pie filling. Attending a special blogger event, ours wasn’t a typical experience of dining at the pub, but it did allow us to get a feel for the skills of the kitchen. Whilst, for us, there were some issues with some of the dishes, these are mostly easy to resolve (though I’d start again with that chocolate mousse dessert). Both of us felt that the food showed enough promise that we’d be happy to go back, and we particularly appreciated the handy location when looking for a central place to meet friends. Kavey Eats dined as guests of ETM group. 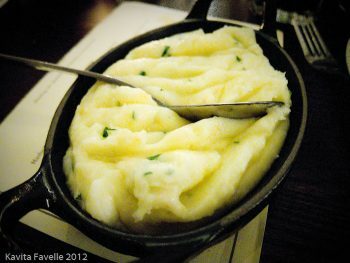 3 Comments to "Angel & Crown: Olde Pub, Newe Management"
It's always helpful to know of good places to eat around Covent Garden and it sounds like, with a little work, this could be another one to add to the list! Thanks Kavey! Oh the pie does look really good. I like food with a bit of theatre thrown in. Pub meals have come a long way since I used to dine out regularly! 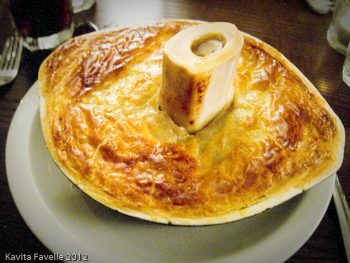 That pie looks amazing, with the big bone sticking out of it!